Do you want to test your limits? Want to know how far your mind and body will sync? 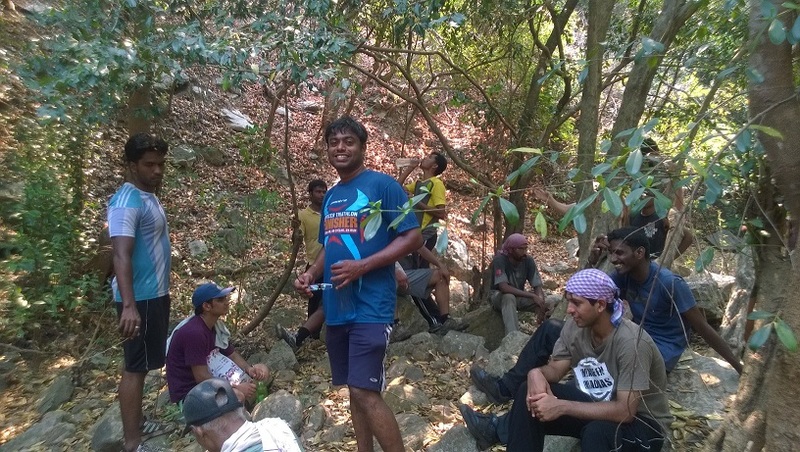 Go for a trek with Peter, the founder of Chennai Trekking Club (CTC). You will definitely push yourselves more than what you think. Your body will stretch to its max like never before, your skins will get scratched with bushes and thorns, your throat and tongue will plea for single drop of water, eyes will burn like anything but the pleasure you get all the while is worth for all the pains. 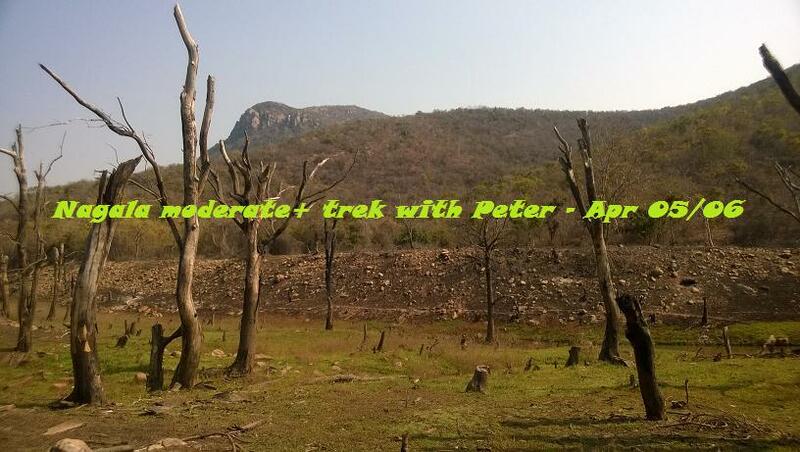 Being a CTC Facebook group member, I happened to know Peter is organizing a 2 days moderate+ trek for fresher/experienced during first weekend of April 2014. Submitted the registration form in Chennai trekkers’ web page the moment they opened the registration. 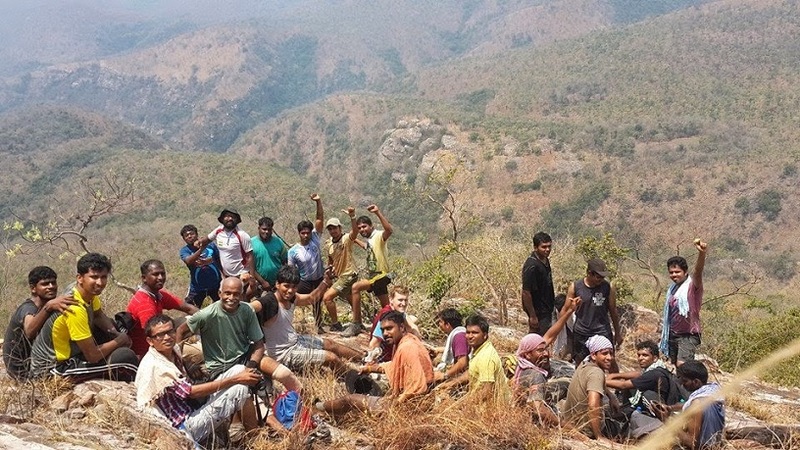 To get selected for any trek with CTC, one should clear a physical fitness test which Peter conducts in Pallavaram hill or should have a prior proven trek experience. I’ve already tried a trek with Emperors, a wing of CTC and this helped me to join this trek. 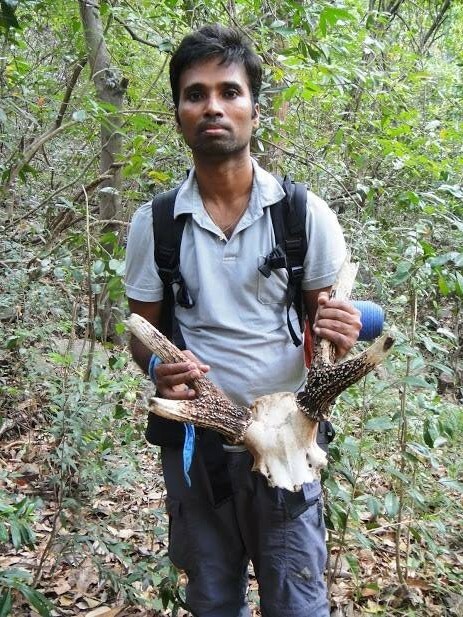 I was too excited when I see the confirmation mail for Nagala Moderate+ trek from Peter and was eagerly waiting for the day; my days were occupied with the thoughts of how the trekking experience is going to be. Finally the day came and around 90+ assembled in CMBT @ 5 AM on Apr 5th 2014. Half of them planned for Navigation boot camp and the rest for the moderate+ trek, both the activities planned for the same weekend. I knew only a few of them and I’ve hardly spoken to them as well, just an acquaintance. Four guys joined in my car and all of them came for the Boot camp. Navigation boot camp is with teams of 3 members whom will be trained to navigate through mountains with the help of GPS. Peter has given some predetermined navigation points to each of the team which should be navigated and recorded in their GPS device. I was not sure whether both the groups will set the base camp in the same place when we start and blindly followed a car with some senior folks in it. Got breakfast for us on the way in Oothukotai and reached a village close to the foot of the hill. We had our breakfast which is supposed to be the last feast of the weekend with Idly, Vada, Pongal, Poori, Vada curry, Sambar and ChutneyJ. Each of us were asked to take 2 Oranges, 2 Lemons, 1 Coconut Boli, 1 Chocolate, 1 Bread loaf and some common gears. After loading them in our baggage we started walking towards the base camp. 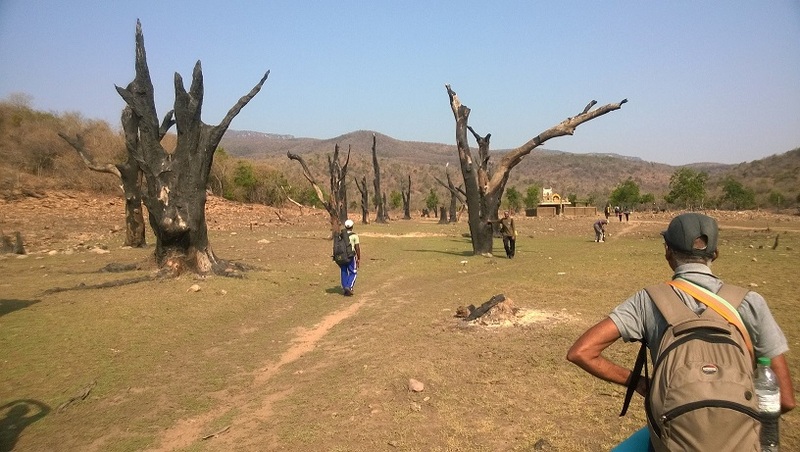 It was a long walk across a dry dam, an old temple in the center of the dam and charred trees. Senior folks told the dam used to be full during rainy days and we should take a roundabout route to reach the base camp. We reached a stream after crossing the dam and followed the stream to reach the base camp. After giving instructions for the Boot campers, Peter joined us to show the real thrilling experience. He asked us to drink as much of water and fill water bottles before starting. We walked on a dry stream after unloading unwanted items. With just water bottle and food items, we continued our walk to reach the base of the stream. The stream was flat in the start and went up gradually. There comes a crevice (kind of cylindrical formation inclined 45 degree upwards) with some water flowing down to a small pool down there. We had to climb up to continue following the stream. 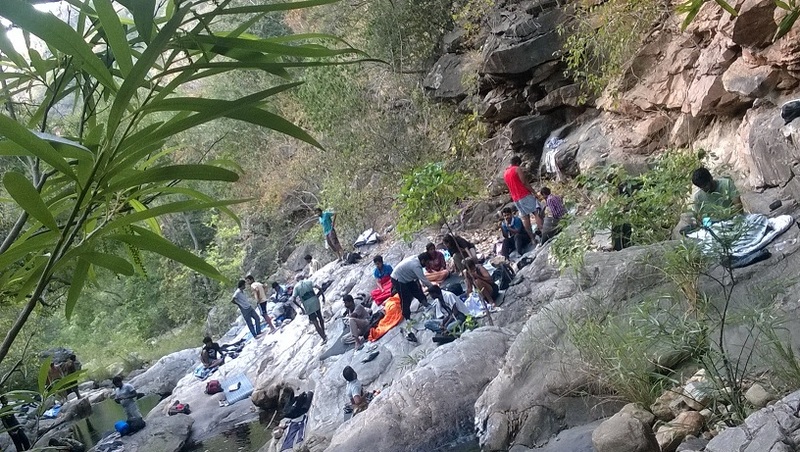 Most of us climbed without slipping but few slipped and got drenched in water. Those whose shoes got drenched had to remove the shoes to climb so as to avoid slipping again. 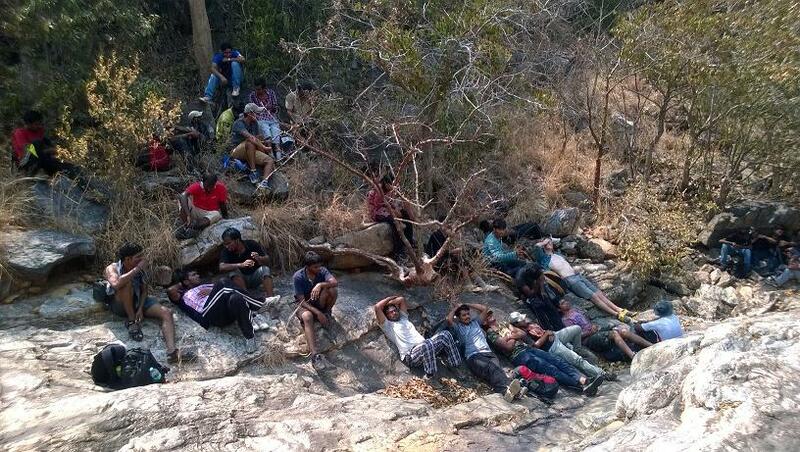 Somehow all managed to climb and we continued our trek. And in the last Peter, the SPIDER MAN climbed it effortlessly just like we climb stairs in our house. We regrouped then and there and decided to have our lunch in a place which was once a pool formed by a falls. We had bread loafs with mayonnaise, sweet boli, oranges and homemade chocolates which we carried all along. We had quite a big meal in the morning and now just breads and fruits. That’s life!!! To continue further we had to climb some steep rocks and on the sides. We followed the stream from the top. 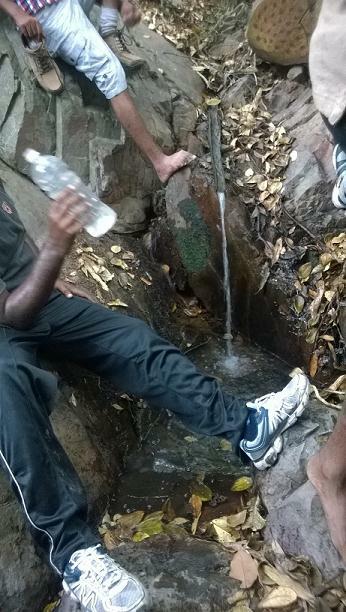 We were almost near the base, all water bottles were empty and everyone was dying hard to get a drop of water. Am sure whoever didn’t care much about water would have realized that water is the most essential need of the human body. 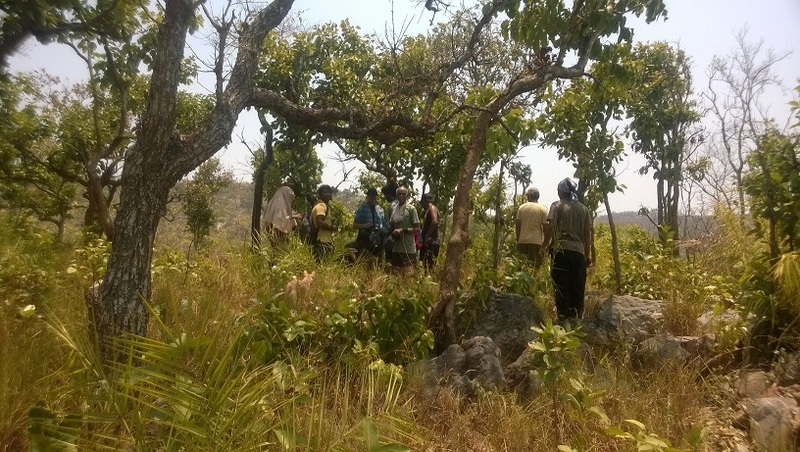 Since some of them were climbing slowly, Peter decided to leave them there and took a few volunteers who can climb quickly to the water point which was about 20min walk away from the base of the stream. We walked quite a long distance and then we realized its Peter’s 20min not oursJ. At last we found the water point and that moment cannot be expressed in words, I can say we saw God in real. We drank water as much as we can and filled the bottles for our co-trekkers who stayed back. Reached back to the waiting spot and everyone quenched their thirst. We followed a trail from there to the dead end pool where we dipped ourselves and relaxed. 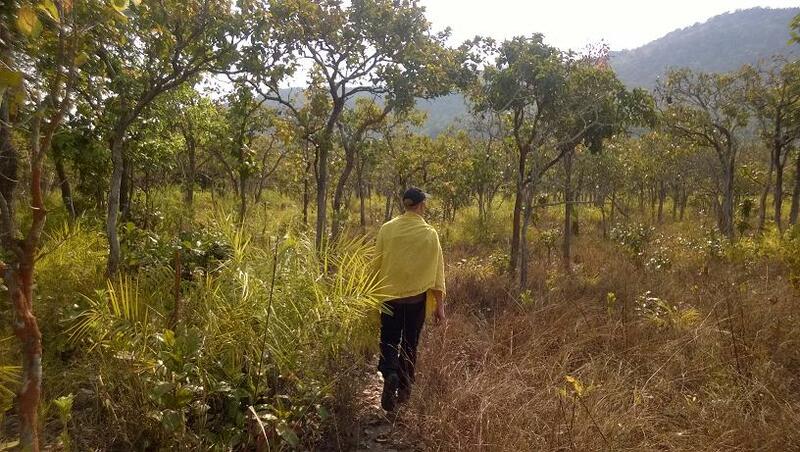 After spending some good amount of time we headed back to the camp retiring for the day. It started to become dark. We somehow managed to reach the camping site with the help of the torch and some senior folks. We collected the unloaded items on the way. 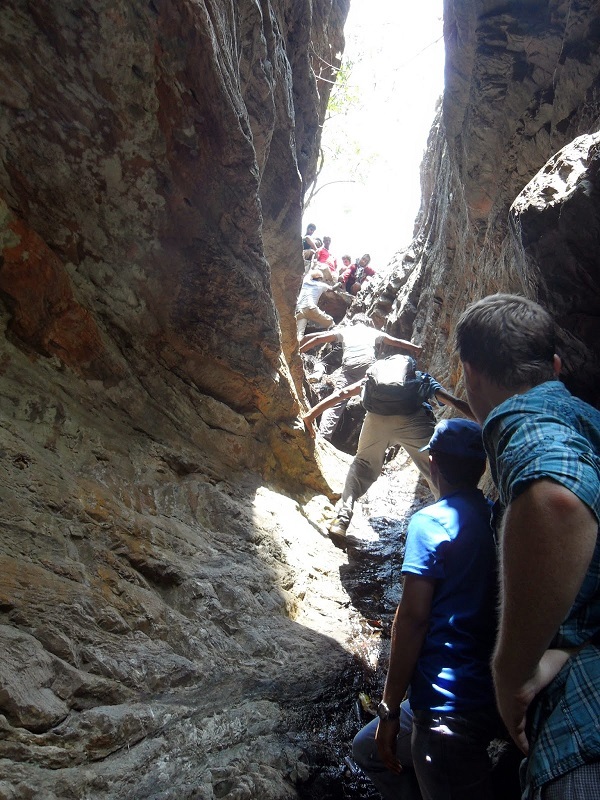 It’s a small gorge where a stream was flowing in between with boulders on the sides. We had yummy noodles for the dinner and everyone started retiring on both sides of the stream. We were just close to the nature on the bank of the stream with natural lights from moon and stars, sound from the flowing stream. All slept nicely in that peaceful atmosphere. What a day it is! We got up early the next day morning after a nice dreamless sleep. We had tea and breakfast – flattened rice immersed in water. 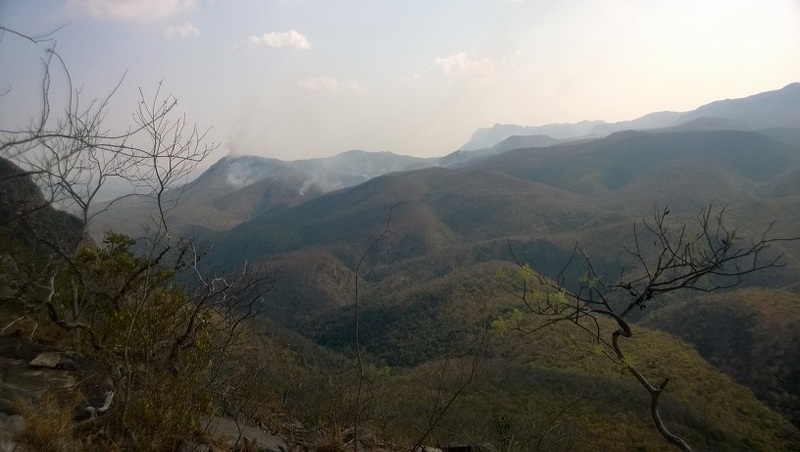 Two levels of trekking were decided for the day. Level one, an easy one and Level two, a tough one. We decided to go till Level one and drop half of the team there to continue to Level two. Again started following the stream and on the way we found horn of a deer. We continued and reached to sliding pool. Water was flowing down and we can slide through to get into the pool. 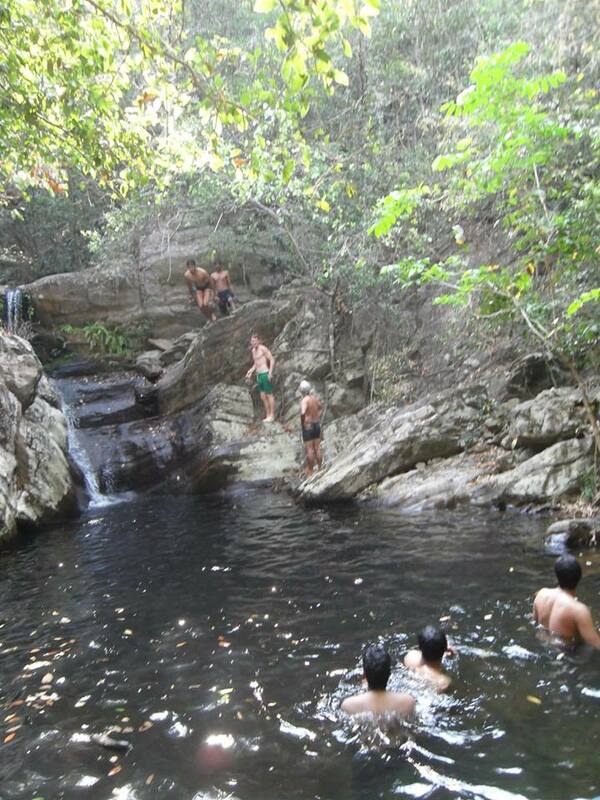 It was deep enough that we can also jump from the top. I was surprised to see some non-swimmers boldly slide into the pool. Peter and Luke pulled them safely to shallow points once the non-swimmers slide into the pool. Some folks just sat and enjoyed watching the fun. We unloaded unwanted items near the sliding pool and walked towards level one. We followed the stream which led to a falls. 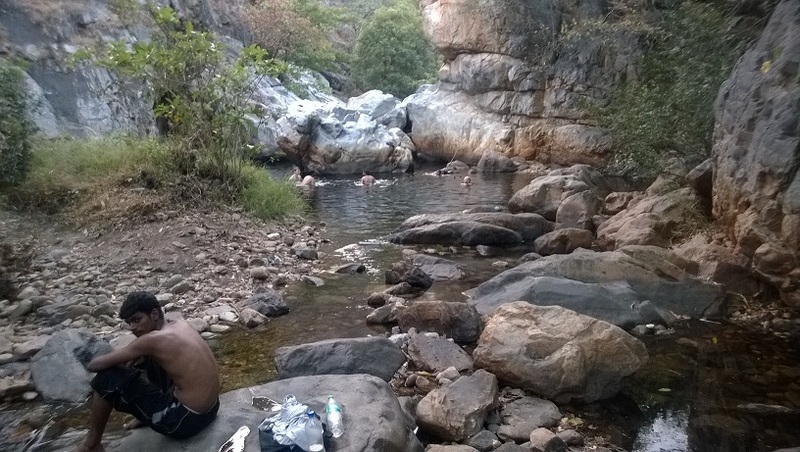 We spent some time in that falls and some guys had a dip there as well. We climbed up further to reach another falls and this was set as Level one. Half of them stayed back and the rest continued to challenging Level two. 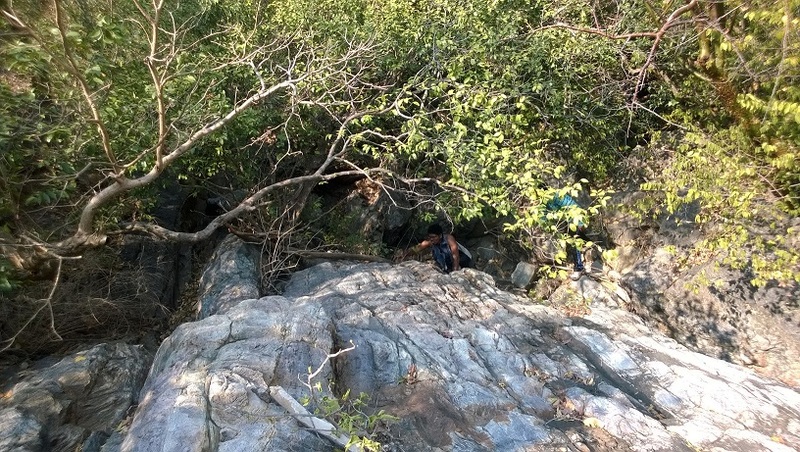 Unlike the previous day, we had to climb up steep rocks with bushes and thorns from the beginning to reach Level two which is a pool located on the top of a 600m ridge. I would say it is more of mental ability than physical strength that drove us. It challenged everyone and tested the physical endurance and mental ability. We crossed many viewpoints which boosted us to push further. Water was over even before reaching the pool. Deepan found Amla tree and picked some amlas which helped us to temporarily withstand. With all struggles; limited water, scorching sun, tiring body we reached Level two. It’s Peter who set the limits and pushed us to reach Level two. Fate played, the pool we were looking for was real dry and no water was found. 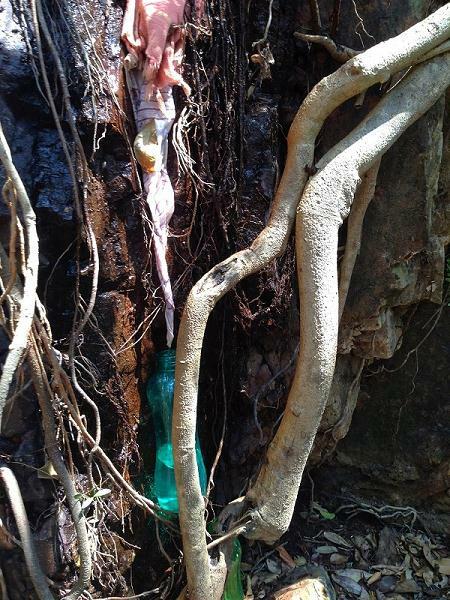 Water was just dripping from the roots of a tree and it took more than 15 min to fill just one water bottle. Somehow we managed to fill few bottles and had our lunch with bread and flattened rice. Took rest for almost an hour and decided to start around 3 PM. Meanwhile some water bottles got filled up. We climbed up further to find a trail which took us back to the sliding pool. Water bottles got emptied again and everyone was very tired. I would say our thirst drove us further to the sliding pool because everyone knows that sliding pool is the only closest water point. We reached the sliding pool somehow and quenched our thirst. We jumped into sliding pool again. Down the sliding pool, there was another pool called Magic pool. We have to jump in from the rock to get into the pool. This height was almost double as that of the sliding pool. 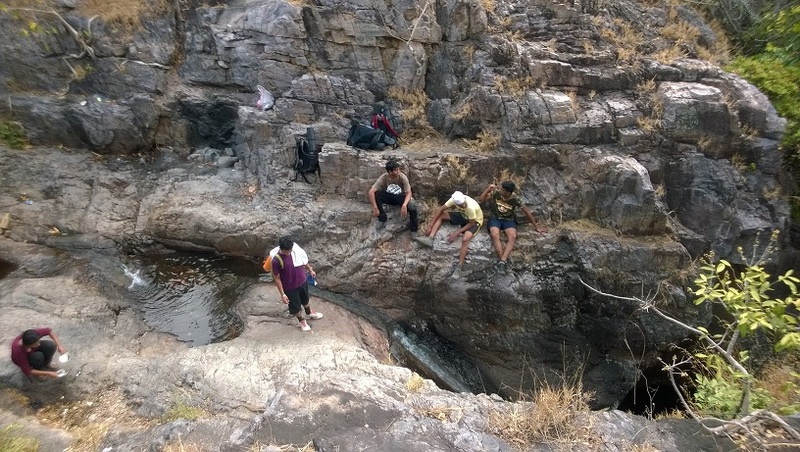 With some guts, only 5 of us jumped in and it was really a thrilling experience. All our energies regained in the pool. CTC core team brought the items which we unloaded in the morning to the sliding pool area. We collected our items and loaded them back in our bags. The trek was over and we walked towards the village where we parked our vehicles. 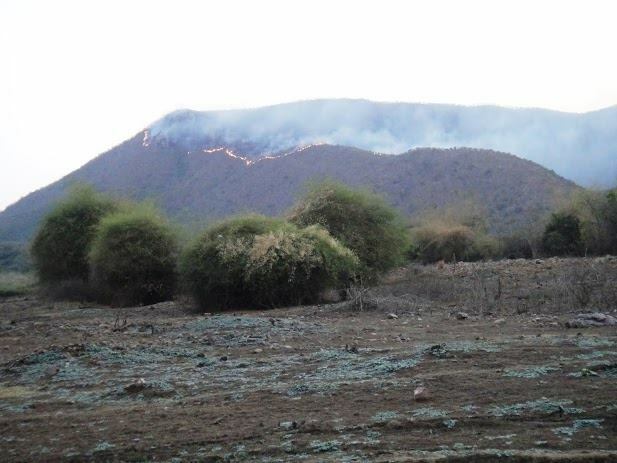 We saw forest fire in the Nagala west when we walked towards the exit. Reached the exit and returned to our homes safely. It was 10 when I reached my home. What a way to end a week!!! Wonderful weekend I have ever spent in my life. Thanks to Peter and CTC core team for giving us such an opportunity. We could see them saying “Do not underestimate us”, not by words but in action from the only two girls of the trek, Susan and Keerthana. They pushed themselves well and competed almost with everyone. Susan even joined us till the water point on the first day. Great!!! We won’t forget Virapandi and Ganeshram for sharing Coconut burfi, Cake and 5 star chocolates when we did Level 2. Thanks a lot guys. 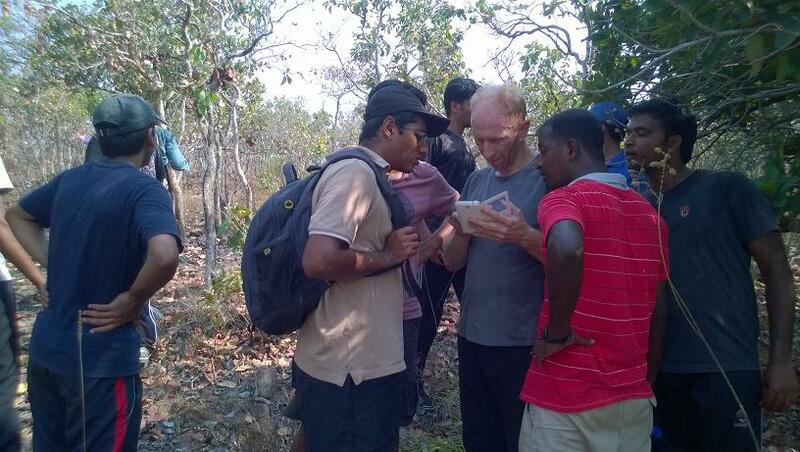 Our special thanks to Karmuhilan, Rajasekaran and Jayanthan for guiding us along with Peter. 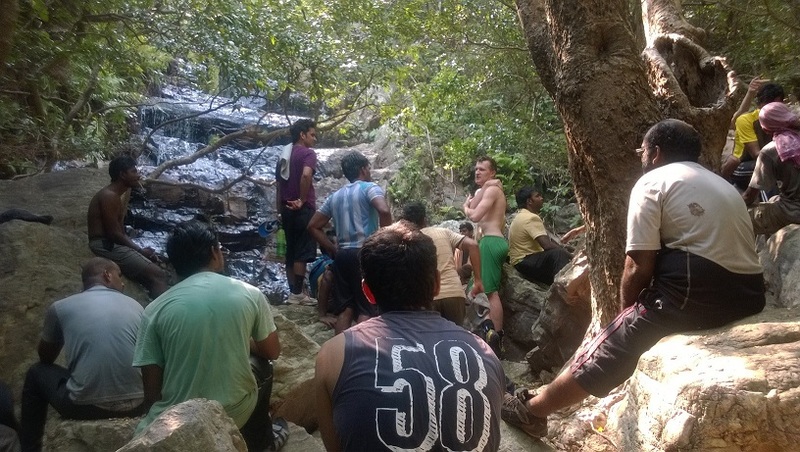 When we tried Level two Rajasekaran pushed the team in the front and Jayanthan patiently waited for the rest then and there and brought the whole team safely back to the sliding pool. Thanks to the CTC core team and volunteers for making all the necessary arrangements. ← CTC Post Trek Write up – To "Divinity" and beyooond ! !